When a group of rogue US marines, led by Brigadier General Frank Hummel (Ed Harris), steal a consignment of nerve gas and take control of Alcatraz Island, an emergency response team is hurriedly assembled. Advising the team are two unlikely partners: FBI chemical weapons expert Stanley Goodspeed (Nicolas Cage) and John Mason (Sean Connery) – a British secret service agent illegally imprisoned by the US government for 30 years. The smartest move that producers Don Simpson and Jerry Bruckheimer ever made was to spend the money required to cast top-notch Hollywood actors, and to then let those actors flesh out their characters in interesting ways. It was a technique that elevated their 1990s action thrillers from run-of-the-mill genre fare to top-of-the-line box office hits. 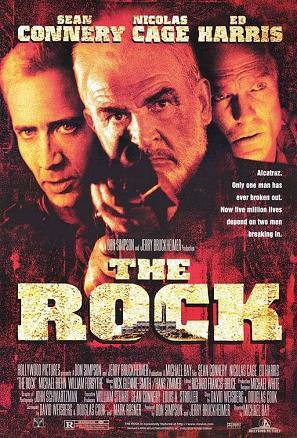 The Rock is a perfect example, since a quick glance at its storyline reveals a fairly ordinary military action vehicle. Despite the simple story, however, the film is elevated enormously by its cast: not just Cage, Harris and Connery, but a raft of great supporting players including Michael Biehn, David Morse, Tony Todd, William Forsythe and John Spencer. Ed Harris seems the clear standout in the film. He takes a character who could easily have been presented as a diabolical madman – a lunatic holding San Francisco to ransom with missiles packed with nerve gas – and gives him depth, subtlety and most importantly a sympathetic personality. We get to see how reluctantly Hummel has staged his terrorist attack, and how deeply each threat he makes weights upon him. Harris transforms him into a good man doing a bad thing for what he sees as a just and noble reason. When the hollowness of that nobility becomes apparent during the film’s climax, we get to see his resolve falter and his heart sink. It seems unfair to refer to his character as a villain, but as an antagonist at least he was one of the best that 1990s Hollywood generated. It is easy to forget in retrospect that casting Nicolas Cage here as an action hero was really working against his image. Cage spent the bulk of his early career delivering slightly manic, off-kilter performances in a range of independent or quirky features. Seeing him front-and-centre in a big-budget action blockbuster was a remarkable shift, and a challenge to which he rose marvellously. The idiosyncratic performance style is still there, but it has a much grander backdrop behind it. For Sean Connery the role was less of a change than a return, since the role of John Mason was effectively James Bond in his mid-sixties. He plays it with charisma and good humour, although some of his dialogue does seem a poor fit (his ‘winners and cheerleaders’ exchange with Cage continues to grate with every viewing). The supporting cast flesh out the film admirably. The late John Spencer may play yet another ill-tempered authority figure, but it was a role he played so well that he cannot help but make it convincing. Michael Biehn’s presence is a fabulous piece of misdirection, setting him up as a key supporting player before abruptly taking his character off the board entirely. David Morse is a solid and intelligent back-up to Ed Harris, while Gregory Sporleder and Tony Todd are marvellous as the murderous, trigger-happy mercenaries who are revealed as the film’s true villains. Michael Bay directs the film with what was already a trademark level of stylistic excess. Nearly every shot is colour-tinted. Each action beat descends to slow motion. Even low-key scenes of dialogue get shot from a wide angle lens. It is a look that is easy to mock, but it also works very well. There is a tonal consistency to the entire film, and numerous key moments that look fantastic. It is also remarkable just how much variety gets squeezed into the film’s action scenes, including shoot-outs, hand-to-hand combat, explosions, and – most improbably – a gleefully destructive car chase through San Francisco. There are smart films and stupid films, and then there are films like The Rock: a smart film self-assured enough to be remarkably stupid at the same time. It is not perfect. The film is arguably over-long, and it is overwhelmingly male to the point of feeling oppressive. What female roles exist – Claire Forlani as Mason’s estranged daughter, Vanessa Marcil as Goodspeed’s fiancee Carla – are relatively limited, and only really exist to give both Goodspeed and Mason a reason to risk their lives defeating Hummel. There is also a small but unsettling element of racism: African American characters in the film are either violent mercenaries or comedy cameos: check, for example, the way that the civilian hostages on Alcatraz act based on their skin colour. If they’re white, they silently cry or stare soulfully. If they are black, they tend to swear a lot and deliver outlandish, comedic dialogue. Despite these relatively minor criticisms, The Rock is a huge, noisy spectacle. It boasts engaging visuals, great performances and a strong musical score by Hans Zimmer and Nick Glennie-Smith. As an example of mid-1990s American action cinema, it is honestly tough to beat.